Supply chain management enables enterprises to source the materials necessary to create a product or service and deliver that product or service to customers. Here's how to make the most of your SCM strategy. What is the extended supply chain? What is the impact of globalization on the supply chain? How do legislation and regulation complicate the global supply chain? How should the supply chain be measured and monitored? What impact do blockchain and smart contracts have on the supply chain? How is electronic data interchange (EDI) impacting the supply chain? Supply chain management (SCM) is the process and activitity of sourcing the raw materials or components an enterprise needs to create a product or service and deliver that product or service to customers. The goal of SCM software is to improve supply chain performance. Timely and accurate supply chain information allows manufacturers to make and ship only as much product as can be sold. Effective supply chain systems help both manufacturers and retailers reduce excess inventory. This decreases the cost of producing, shipping, insuring, and storing product that cannot be sold. Planning—Enterprises need to plan and manage all resources required to meet customer demand for their product or service. They also need to design their supply chain and then determine which metrics to use in order to ensure the supply chain is efficient, effective, delivers value to customers, and meets enterprise goals. Sourcing—Companies must choose suppliers to provide the goods and services needed to create their product. After suppliers are under contract, supply chain managers use a variety of processes to monitor and manage supplier relationships. Key processes include ordering, receiving, managing inventory, and authorizing supplier payments. Making—Supply chain managers coordinate the activities required to accept raw materials, manufacture the product, test for quality, package for shipping, and schedule for delivery. Most enterprises measure quality, production output, and worker productivity to ensure the enterprise creates products that meet quality standards. Delivering—Often called logistics, this involves coordinating customer orders, scheduling delivery, dispatching loads, invoicing customers, and receiving payments. It relies on a fleet of vehicles to ship product to customers. Many organizations outsource large parts of the delivery process to specialist organizations, particularly if the product requires special handling or is to be delivered to a consumer’s home. Returning—The supplier needs a responsive and flexible network to take back defective, excess, or unwanted products. If the produce is defective it needs to be reworked or scrapped. If the product is simply unwanted or excess it needs to be returned to the warehouse for sale. 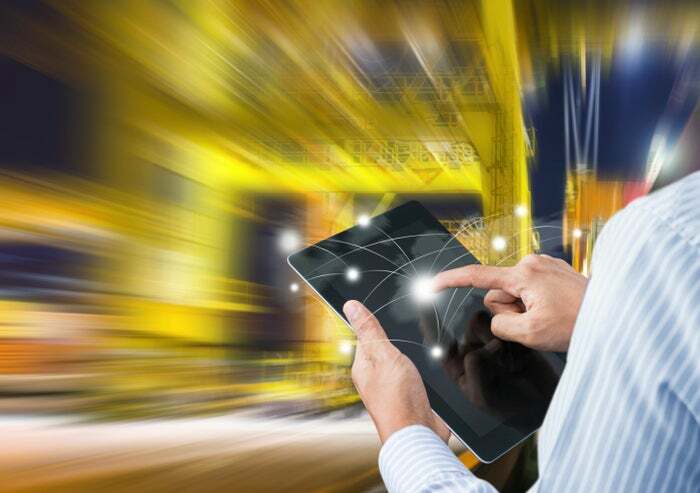 Enabling—To operate efficiently, the supply chain requires a number of support processes to monitor information throughout the supply chain and assure compliance with all regulations. Enabling processes include finance, HR, IT, facilities, portfolio management, product design, sales, and quality assurance. For a more detailed outline of these steps, check out the nonprofit Supply-Chain Council's website. Walmart and Procter & Gamble began to work together in the late 1980s and are the classic example of supply chain collaboration. Before these two companies began working to connect their supply chains, retailers and manufacturers shared little information. After Walmart and P&G demonstrated that shared information reduced cost, other retailers became more willing to consider the possibility. In the early 1990s Walmart formalized its Retail Link system and cajoled (some would say strong armed) other retailers to connect. Over time, the Walmart POS system was able to aggregate sales of individual P&G products at each store. When the POS indicated that inventory for a particular product had fallen to a predetermined threshold, the Walmart distribution center was notified to ship additional product to the store. As inventory in the Walmart distribution center fell to its threshold, the P&G distribution center was automatically alerted to ship additional product. Today, this continuous flow of information helps P&G to determine when to manufacture and ship products to Walmart. By avoiding manufacturing too much inventory and by automating the billing and payment process, both firms enjoy low costs. Identifying potential problems before they occur. When a customer orders more product than the manufacturer can deliver, the traditional response has been to short the order. This leaves the buyer feeling unimportant and convinced the manufacturer’s service is poor. Manufacturers who anticipate the shortage before the buyer is disappointed may be able to offer a substitute product or other incentive to keep the buyer happy. Optimizing price dynamically. Seasonal products, particularly fashion products, have a limited shelf life. Any that don’t sell by the end of the season are scrapped or sold at deep discounts to empty the warehouse. Airlines, hotels, and other companies with a limited, but perishable product, adjust prices dynamically to meet demand. While this is more difficult with clothing and other products where the supply can vary widely, similar forecasting techniques can improve margins. Improving the allocation of available to promise inventory. Today’s tools dynamically allocate resources and schedule work based on the sales forecast, actual orders, and promised delivery of raw materials. Manufacturers are able to confirm a product delivery date when the order is placed, significantly reducing incorrectly filled orders. The extended supply chain includes all companies that contribute to a product. This means that the extended supply chain includes the suppliers to your suppliers as well as the customers of your customers. When companies encounter supply chain problems, the initial action is to ask the supplier about the situation. However, organizations that monitor the extended supply chain have the option of reaching back through the primary supplier to the company that supplies components to the primary supplier. As an example, if a popular baseball hat is not available from the manufacturer, the normal reaction of the store manager is to contact the manufacturer. However, if the retailer monitors the extended supply chain, the store manager would know the manufacturer was having trouble getting the brim. If it appears that additional brims will not be available to the manufacturer quickly, the retailer would have time to seek a different supplier. Twenty-five years ago, one of the main reasons companies created global supply chains was to take advantage of lower wages in other countries. In general, it was fairly easy to off-set the increased shipping costs resulting from remote manufacturing. However, salary arbitrage advantages are eroding as wages in lower cost countries are rising, improved process and robotics allows plants to be operated with far fewer people, and local firms are becoming strong competitors in virtually every industry. One of the advantages of the global supply chain has been the ability to scatter patents and manufacturing sites around the globe. This allowed companies to report profits in countries with low corporate taxes. However, many of these arrangements are being challenged. In 2016, the European Commission ordered Apple to pay Ireland €13bn in back taxes, ruling that Apple’s tax agreement with Ireland amounted to illegal state aid. The antitrust chief of the European Union, Margrethe Vestager, recently began investigating Amazon’s European tax practices. Google and other technology firms are also being investigated by the EU. Dodd-Frank requires companies covered by the SEC’s Exchange Act and which either manufacture or have “actual influence” over the manufacturing process to report if their product contains gold, tin, tantalum, tungsten or other “conflict minerals.” Conflict minerals are mined in the Democratic Republic of Congo or other war zones with the profits used for continued fighting. California’s Safer Consumer Products Regulation is part of that state's Green Chemistry Law and covers products that contain a “Chemical of Concern.” Manufacturers, importers, assemblers and retailers must notify the Department of Toxic Substance Control of potentially dangerous products and must determine how to limit exposure to them. The U.K.’s Modern Slavery Act contains a Transparency in Supply Chain provision that attempts to eliminate slavery. Companies doing business in England and Wales with sales exceeding £36 million have to include a description, on their website, of their efforts to make sure slaves are not used in any part of their supply chain. The EU’s Regulation on Registration Evaluation, Authorization and Restriction of Chemical (REACH) covers any chemicals in paint, clothing, electronic products, furniture, etc. that might be dangerous. Companies making or selling products in the EU with a restricted chemical, needs to show the European Chemicals Agency that the product offered for sale is safe. Similar regulations are emerging in Denmark, China, South Africa, Malaysia, and other countries, and virtually all focus on keeping products safe, reducing human trafficking, or prohibiting profits from being used to continue fighting. Unfortunately, enforcement processes are not coordinated and data is not shared among different governments. Worse, reporting requirements will probably change as war zones shift and conflict materials list lengthens. Although the objectives are commendable, additional reporting requirements make supply chain management even more difficult. Well-run supply chains are measured in a variety of different ways. Metrics help people focus on the most important activities and improve existing processes. Critical metrics support regulatory compliance, safety, or contractual obligations. Other metrics monitor and improve efficiency, improve service, and produce greater profits. Fill rate – The percentage of orders that are delivered as ordered on the first shipment. In reality there are hundreds of supply chain metrics. The art is to find the right ones for your industry and your business. See also: "5 ways big data will shake up the supply chain." A smart contract automates the “if this happens then do that otherwise do something else” part of traditional contracts. Computer code behaves in a predictable way without suffering from the linguistic nuances of human languages. In theory, a smart contract allows enterprises to sign a normal paper contract that includes a pointer to computer code encapsulated in a blockchain. The parties agree that both will abide by the results the code produces as long as the contract is in force.